The metrics are bad and getting worse. Nearly every metric at the Signet stores is declining. Signet Jewelers Limited engages in the retail sale of diamond jewelry, watches, and other products. As of February 02, 2019, it operated 3,334 stores and kiosks. The company operates through three segments, North America, International, and Other. The North America segment operates stores in malls and off-mall locations primarily under the Kay Jewelers, Kay Jewelers Outlet, Jared The Galleria Of Jewelry, Jared Vault, Zales Jewelers, Zales Outlet, Piercing Pagoda, Peoples Jewellers, Gordon's Jewelers, and Mappins Jewellers regional banners; and JamesAllen.com, an online jewelry retailer Website. This segment operated 2,729 locations in the United States and 128 locations in Canada. The International segment operates stores in shopping malls and off-mall locations, principally under the H.Samuel and Ernest Jones brands. This segment operated 477 stores in the United Kingdom, the Republic of Ireland, and the Channel Islands. The Other segment is involved in the purchase and conversion of rough diamonds to polished stones, as well as provision of diamond polishing services. Signet Jewelers Limited was founded in 1950 and is based in Hamilton, Bermuda. Company description from FinViz.com. 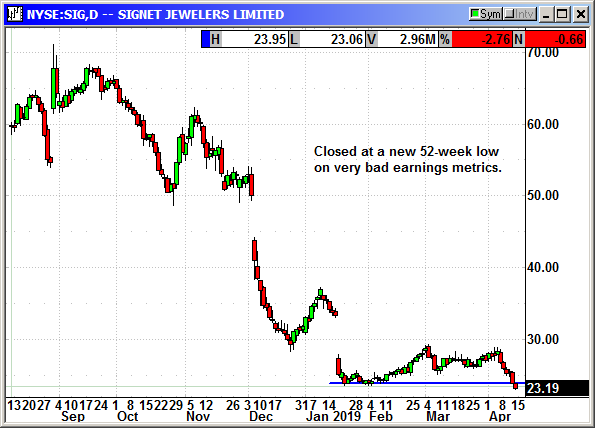 On April 4th, Signet Jewelers reported earnings of $3.96 that beat estimates for $3.77 but that was still a decline of 7.5% from the year ago quarter. Revenue of $2.154.7 billion beat the estimates for $2.142 billion but declined 6% year over year. Globally same store sales declined -2% with sales in North America down -5.5%. The average number of transactions declined 4%. Sales at Zales stores declined -2% and Piercing Pagoda sales declined -17.1%. Kay stores fell -1.6%, Jared -8.4% and James Allen -1.4%. international sales declined -16.6% to $195 million and same store sales fell -7.3%. Average transaction values declined -5.4% and the number of transactions declined -2.3%. They guided for Q2 for a loss of 17-28 cents and analysts were expecting a loss of 6 cents. Same store sales are expected to decline between 0.5% and 1.5%. For the full year they guided for earnings of $2.87-$3.45 and analysts were expecting $3.53. Same store sales are expected to be down -2.5% for the year. They closed 262 stores in 2018 and plan to close another 150 in 2019. There was NOTHING to like about these earnings. Shares have fallen $5 since April 4th and with metrics like those they could fall significantly lower. Shares closed at a new 52-week low on Friday. Sell short SIG shares, currently $23.19, stop loss $24.15. Optional: Buy July $20 put, currently $1.50, stop loss $25.65.